NZCCSS is once again hosting its Services for Older People Conference. With the theme of Together We Can, the two day conference calls for the sector to build cooperation and a vision for working together with older people to make a difference in their lives and the lives of those around them. Registrations are now open. Visit the NZCCSS website for a copy of the brochure and registration form. The government recently announced that the minimum wage is to increase from $12.50 per hour to $12.75 per hour. This equates to an extra $10 per week for a full time worker on the minimum wage. And remember this figure is gross not net. A NZ Herald polls showed that about 60% of people supported an increase to $15 per hour. The 25c per hour increase has been widely condemned as miserly and unlikely to have any impact on families in hardship. The government has recently announced that it will be closing a successful pilot programme for young offenders because of its high cost. Te Hurihanga, based in Hamilton is “an innovative pilot therapeutic, residential, educational and cultural programme funded by the Ministry of Justice & facilitated in partnership with Raukura Waikato Social Services.” It ticks all the boxes for ‘best practice’ offering tailored and flexible support “integrating evidence-based clinical, cultural, residential and community treatment for recidivist young males who are at a high risk of re-offending”. The government has said “the programme is to be replaced by a similar but more cost-effective one that will allow more young people to participate, and will more closely align to the Government's Fresh Start initiative.” Kim Workman, Director of Rethinking Crime and Punishment (RECAP) has described the government’s decision as ‘defying logic’. As he points out in a press release “The $167,000 per annum cost per offender is a wise investment, for someone who without treatment, is likely to spend around ten of the next twenty years in prison, at a total cost of $800,000 or $100,000 a year.” We couldn’t agree more. • ….. but children are still significantly over-represented in the hardship group …. CPAG has responded that “the level of inequality is unacceptable”. CPAG’s Susan St John asked the critical question "is the current level of inequality and poverty acceptable? 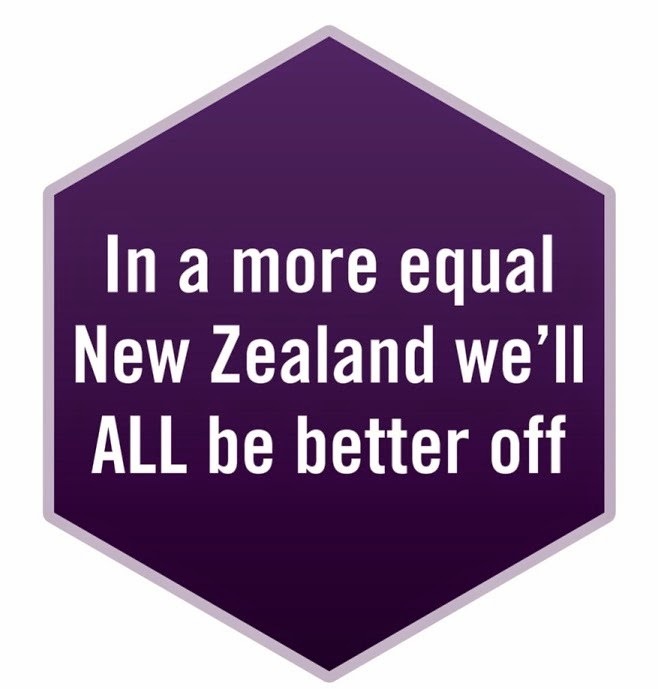 …New Zealand's after-tax distribution is one of the most unequal in the OECD, and child poverty rates are a national disgrace." Simon Collins from the NZ Herald has commented on the Living Standards survey in an article Families with Kids Feel the Pinch "New Zealand's reputation as a good place to bring up children has taken yet another hit - this time from an official survey finding that families with children are far more likely to be in hardship than any other New Zealanders”. Also see comments from Tapu Misa in an article Equal Chance for All. Interested in social issues in Auckland? The Minister for Social Development and Employment, Paula Bennett, has released a discussion document on the newly formed Auckland Social Policy Forum: "We want to feedback on the form and function of the Forum, the types of issues it should be considering, and how it can best engage with Auckland's diverse communities and social organisations." NZCCSS has met with Auckland based members to consider our response. We would encourage members to make their own submissions or contact us regarding issues of concern. Submissions close on Friday 21 May 2010. It’s good to see a realistic timeframe. Simon Collins from the NZ Herald has also reported on Auckland community groups uniting to lobby super city. The ASB Community Trust has recently announced a new funding opportunity to support community organisations delivering pilot community housing projects aimed at preventing or solving homelessness or the need for emergency housing. The first funding round closes 1st April 2010 and funding decisions will be announced early December 2010. Projects must benefit youth, women, Māori and/or Pasifika. Professor Peter Marsh, an academic from the University of Sheffield in the UK will be making a public presentation on a new project in the UK using a ‘social enterprise’ approach to delivering social work services to children in the care of the state. Social enterprise is described as businesses with a social purpose, which run at a profit which is reinvested in the services themselves. The seminar is being run by the Institute of Policy Studies at Victoria University in Wellington, 2 March 12.30pm, RW 501 Railway West Bdg, Bunny Street, Wellington. To register ips@vuw.ac.nz There is no cost. The Regulatory Responsibility Taskforce Report, and its recommended Regulatory Responsibility Bill, proposes major constitutional changes in the way legislation and regulations are promulgated in New Zealand. The Institute of Policy Studies has organised a one-day symposium to advance public debate on the Bill. The symposium will run from 9am to 4pm on Tuesday 16 February 2010, Pipitea Campus, Victoria University of Wellington. The establishment of the Taskforce was included in the ACT-National Confidence and Supply Agreement and is part of ACT’s policy on improving regulatory transparency and accountability. Associate Minister of Education Heather Roy has opened public consultation on the Review of Special Education. If you have an interest in the education of disabled students in NZ schools, have your say. Submissions close Friday March 19, 2010. For more information contact SE.review@minedu.govt.nz or call (04) 463 8000. Designertech is offering two free seminars “Information and Technology Management in the NFP / NGO sector In the Era of Cloud Computing”. Auckland, 11 February and Wellington 15th February. More info email info@designertech.co.nz ring 09 571 1450. • A new report is due out this week from the Whanau Ora Taskforce that will outline a new approach to welfare and health service delivery for NZ’s most at risk families. • The 2010 State of the Nation speech by John Key with its focus on economic growth. Colin James speculates on the contents of the speech.